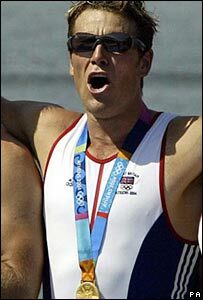 Two gold medals have been stolen from Olympic rower James Cracknell during a break-in at his home in west London. Burglars also stole a laptop containing pictures of his rowing attempt across the Atlantic and 20,000 words of a book he is writing based on the journey. Cracknell is offering a reward and is said to be particularly upset about the loss of his laptop and wedding ring. The medals are gold-plated silver and worth hundreds rather than thousands, said fellow Olympian Matthew Pinsent. Cracknell told BBC News he was "gutted" by the burglary especially as his young son Croyde was in the house at the time. Pinsent, who lost one of his own gold medals in the back of a taxi, said the medals would be impossible to sell on. He added that while everyone imagines they are solid gold, the actual value of them is relatively small. Cracknell won gold in Sydney in 2000, and again four years later in Athens, when the British coxless four snatched victory from Canada in a nail-biting photo finish. He spent almost 50 days in a boat rowing across the Atlantic with TV presenter Ben Fogle. The pair came third in the Atlantic Rowing Race in January after capsizing.